Heat oven to 375°F. Slit hot dogs to within 1/2 inch of ends. Insert 3 strips of cheese into each slit. Separate dough into 8 triangles. Spread 2 teaspoons refried beans on short side of each triangle. Top each with 1/2 tablespoon bacon bits. 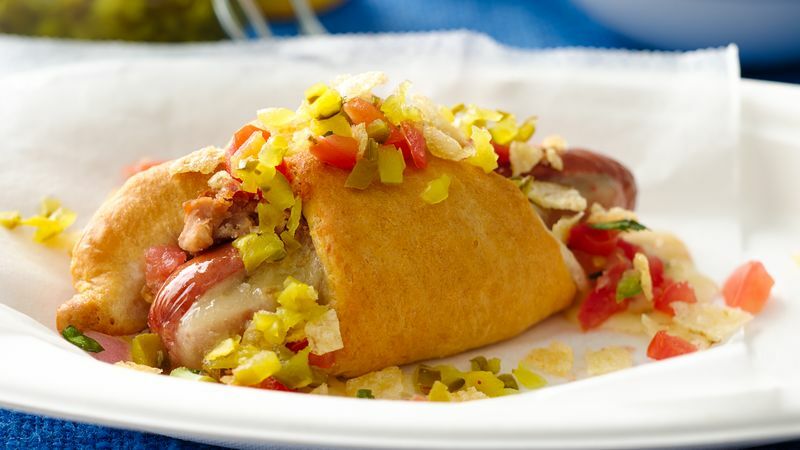 Wrap 1 dough triangle around each hot dog. Place on ungreased cookie sheet, cheese side up. Bake 18 to 22 minutes or until golden brown. Top with remaining ingredients. Swap out the pico de gallo for salsa, if desired.